Well, I was off by 11 days. In March I forecast that the price of gold would set an all time high record (ignoring inflation) by the end of April. I was premature. I didn’t happen until May 11. The COMEX closed at $1,220 for gold and $19.27 for silver on May 11, breaking the former gold high set early last December. 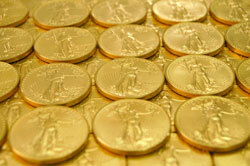 Today, gold closed at $1,243 and silver at $19.66, the highest price since mid-March 2008! On top of all the financial turmoil spurring investors to purchase precious metals as a safe haven against the decline in the value of paper assets such as stocks, bonds, and currencies, it was a vote in the US Senate on May 11 that I credit with pushing gold up to the new high. After Rep. Ron Paul’s (R-TX) HR1207 bill to audit the Federal Reserve passed the entire House, the companion S604 bill in the Senate had been stalled. Introduced by Sen. Bernie Sanders (I-VT), the Senate version had attracted 32 co-sponsors but no action. Senator Sanders made an effort to incorporate this bill into the Financial Reform legislation now pending in the Senate. When this effort was not successful, he introduced a watered-down version that called only for a one-time audit of the Federal Reserve including disclosure of all the recent recipients of the $1-2 trillion in government bailouts of the financial industry. Not only did this second version pass the Senate on May 11, the vote was a unanimous 96-0! While there is a long way to go before this provision is incorporated in any legislation that finally gets enacted, the message rang throughout the financial world. Federal Reserve officials had been engaged in high pressure lobbying tactics to kill any such legislation for the past few weeks, repeating the mantra that its passage would hurt the value of the US dollar, drive up interest rates, and lead to higher consumer prices. At least for now, the politicians have decided that it is better for their political careers to be somewhat more honest and transparent with voters than to continue to operate with high levels of secrecy. In the past week, gold has twice managed to increase by more than the almost magical 2% daily limit apparently imposed for the past few years by the US government and its trading partners. While the feds appear to be losing their ability to suppress prices, they still have substantial clout to slow down continuing price increases. So, even though I expect gold to reach at least $1,500 and silver well above $20 by early fall, it will not be moving in a straight line. There will be interim rounds of profit-taking along the way, so don’t let them scare you into thinking the market has peaked. A Swiss resident on May 11 tried to order 4,000 US Silver Eagle Dollars. Not only did he fail to find any in Europe that he could purchase, the best deal he found was for only 2,000 coins for delivery one week out at a price that was 32% above the silver spot price! Not only does it look like physical gold is almost impossible to purchase in Europe, maybe physical silver is becoming a scarce commodity as well. I expect supply problems to get even tighter in Europe in the coming weeks, and for physical precious metals to disappear from dealer inventories in the US as well. If you don’t buy gold and silver sooner, you may not be able to buy later! P.S. Good riddance to ex-British Prime Minister Gordon Brown. He is the man perhaps most responsible for the Bank of England selling off over half its gold reserves for about $250 per ounce roughly a decade ago, at the lowest gold prices in the past three decades! It is almost fitting that he resigned as prime minister on the day that the price of gold set an all time high record. Patrick A. Heller owns Liberty Coin Service in Lansing, Michigan and writes “Liberty’s Outlook,” a monthly newsletter covering rare coins and precious metals. Past issues can be found online at http://www.libertycoinservice.com/ Pat Heller is also the gold market commentator for Numismatic News. Past columns online at http://numismaster.com/ under “News & Articles”. His periodic radio interviews can be heard on WILS 1320 AM in Lansing, www.talkLansing.net, and on www.yourcontrarian.com.